Imran Khan addressing a huge rally at Miawali. 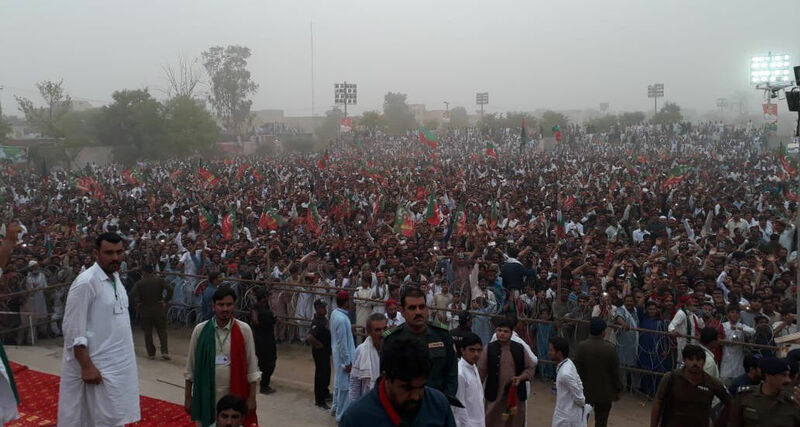 Chairman PTI Imran Khan kicks off his party’s election campaign from Mianwali Jalsa today. According to sources within PTI, Imran Khan is going to attend 120 rallies in the next 30 days. Mianwali is one of the five constituencies, apart from Islamabad, Lahore, Bannu, and Karachi from where Imran Khan is contesting elections. During his speech at Mianwali, Imran Khan criticized PMLN for ruining all government institutions. However, Imran Khan’s marathon of rallies for the next 30 days will include every constituency of Pakistan. “Imran Khan will attend four rallies every day”, said a PTI official. PTI has fielded strong candidates this elections and has favoured electables for party tickets. “We wanted to give tickets to those who actually know the art of running an election campaign”, said Imran Khan. “Winning elections is an art”, he further said. The real battle however, will be fought between PTI and PMLN in Punjab where there are a total of 141 national assembly seats out of the total 272. In most of the constituencies, neck to neck competitions are expected and the final tally can come out in any one’s favour.